Railway car builders seeking high performance and low maintenance trust Sécheron’s MODBOX® enclosure for rail vehicles running on 1.5 kVDC, 3 kVDC, and 25 kVAC networks worldwide. Each MODBOX® includes integrated functions and interfaces with the vehicle for a turnkey solution that facilitates engineering, logitics, installation and operation. Sécheron brings decades of experience designing and manufacturing electrical safety components and systems for the traction circuits powering trains, high-speed trains, locomotives, and EMUs on AC or DC rail networks. Car builders seeking high performance, reduced engineering work and easier vehicle manufacturing combined with lower maintenance have placed their trust in our MODBOX® enclosure for thousands of rail vehicles running on 1.5 kVDC, 3 kVDC, and 15 kVAC, 25 kVAC networks worldwide. 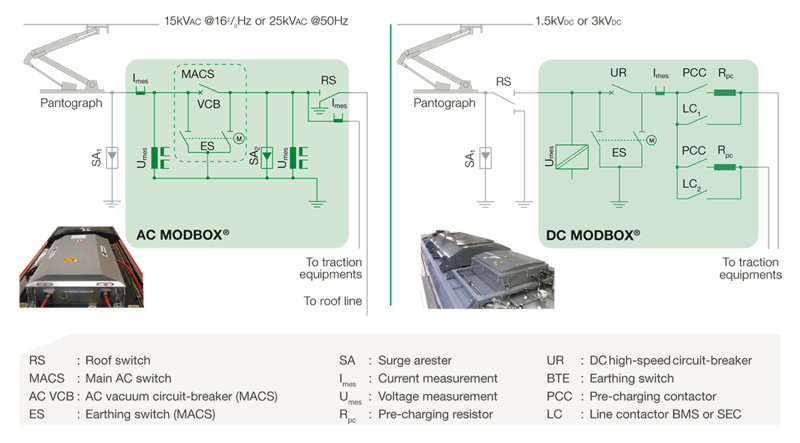 The Sécheron MODBOX® enclosure includes our AC or DC circuit breakers and various high- and low-voltage components. The compact, smart enclosure ensures safe and efficient integration of high-voltage components in vehicle roof or vehicle under-frame installations. Each MODBOX® is engineered and configured to meet the needs of your project, taking into account integrated functions and interfaces with the vehicle. We primarily use Sécheron components and can include other devices from best-in-class suppliers to provide you with a turnkey solution. Thermal current up to 1000 A (AC) or 3500 A (DC). Main integrated high voltage functions: circuit-breaker, surge arresters, current & voltage measurements, earthing switch, line disconnector, line & charging contactors with charging resistor, and others. Height above roof ≤ 535 mm. Reference standards: EN 50124, IEC 62497, IEC 61373, 60077-2, IEC 60077-3, IEC 60077-4.